The Healthy Mind app provides users with nine tools designed to minimise stress and encourage calmness. The free app is a live research project, funded by the Engineering and Physical Sciences Research Council, which will evaluate the effectiveness of notifications sent by the app and how best to use mobile technology to help people reduce their stress levels. It has been designed to establish whether smart phones can sense when the best time for a notification to be sent is. The app will invisibly monitor data such as time of day, physical activity and location of the user to decide when to send the notification. It is hoped that this will increase the chance that the information on the notification reaches the user and helps them to manage stress. People taking part in the study will be in one of three groups and will either receive up to three notifications a day, depending on the data the app collects, one notification a day between 5pm and 8pm, or two notifications during the week between 5pm and 8pm. The notification will contain a suggestion about stress management and encourage users to open the app where more details can be found. The app has been designed using mindfulness theory and cognitive behaviour therapy techniques. Professor Lucy Yardley of the University of Southampton, who is leading the research team, comments: “Most people who are stressed won’t be seeking any kind of help from a professional. Many however will have their phones with them the vast majority of the time and this is an untapped resource in terms of helping people with stress. 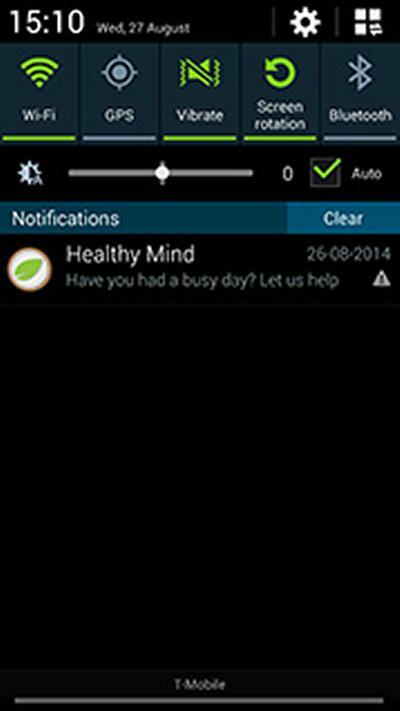 The Healthy Mind app is now available to download for Android devices. Users must be over 18 years old and they will be asked if they want to take part in the trial. The study will run for about five months. The Health Mind app can be downloaded from the Google Play store at http://www.healthymindapp.org. To use Healthy Mind, users will also need to download the ‘My Life Guide Toolbox’, which has the Healthy Mind app within it.